Your restaurant on the Ore Mountains serves typical regional dishes, supplemented by imaginative and creative variations. Depending on the time of year, we use seasonal products to prepare delicious dishes for our constantly changing menus. 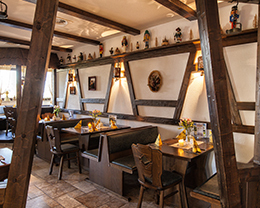 The “Landhaus”, “Bergmannskaue” and “Gute Stube” parts of the restaurant are traditionally furnished and offer a number of details that are typical for the region. 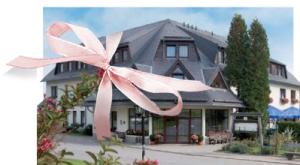 In our panorama restaurant with adjacent summer terrace you can enjoy a breath-taking view of the Ore Mountains. It goes without saying that vegetarians do not have to go hungry in our hotel either! 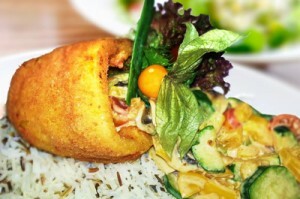 We cater for the growing trend towards a vegetarian or vegan diet accordingly with changing seasonal offers. Our menu contains a wide selection of meat-free dishes, purely vegan dishes are also marked separately. In addition to our à la carte menus, you can also book a special vegan or vegetarian candlelight dinner (for 2 or more persons). „Nu fraat eich ihr Leit, in Arzgebirg is Weihnachtszeit. True to this saying, you can enjoy original “Neinerlaa” from the Ore Mountains – either as a traditional variant with “Schwammesupp. Brotwurscht un Sauerkraut” or as a modern variant with “Linsensupp, feiner Ganslbrotn ausn Dippl”. Are you looking for that special something for an anniversary, for birthday, Christmas or just to say thank you? We will be happy to issue a restaurant and hotel gift voucher for any occasion and for any amount with a personal address, dedication and greetings.